If you need to hang drywall, paint, or otherwise work on an elevated area, you are undoubtedly aware of what a hassle it is to constantly re-position a ladder as you work your way around the room. For many contractors and DIY-types, purchasing a pair of construction silts can be an efficient way to do some electrical or drywall work, perform painting jobs, or work on drop ceilings, in addition to a variety of other applications. They're built from heavy-duty but lightweight materials (generally aluminum or magnesium), feature rubber gripping feet that hold you securely in, and Velcro straps to further tighten your feet into place so you you can maneuver around and get the job done without taking a spill. If you are working with particularly high ceiling areas you'll probably end up using a scissor lift or scaffolding, but for lower-heights (think an adjustable range of between 18" to 30"), drywall construction stilts can be a great option. Adjusts in height from 18" to 30"
The Pentagon Tools drywall stilts- come in blue, black and red options. The manufacturers really emphasize the convenience of their adjustable heel plates as well as the self-locking metal buckles that provide an adjustable height from 18" to 30" and a robust 228 lb. load capacity. Pentagon Tools describes their drywall stilts as being excellent for working on drop ceilings, performing arduous painting jobs, doing electrical work and a host of other applications. In order to have the best experience with these drywall stilts, one user advised new users to have somebody else help you with them- this extra person can fit them on you properly, adjusting and fine-tuning the fit so that you are effectively balanced. And they can help you to standup- which can be a comical hassle to start. Another buyer who had especially small feet say that the straps were ineffectual for her- so she ended up purchasing some Velcro to create a tighter fit for her as she used them. Another minor complaint is that the feet have a tendency to leave black markings on tile floors- so be careful using them in finished homes. Let's take a look at 5 of the best-selling options and see how they compare. These silver drywall stilts offered by Gyp Tool are comfortable, easy-to-use and suitable for carpenters and painters. Users love the price and the easy assembly process, but some do note that the stilts are hard to adjust. 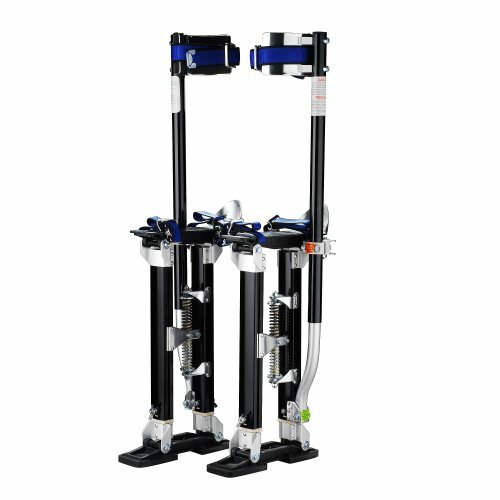 These stilts for drywall taping are made of high-grade lightweight aluminum, and they have a working height of 18″ – 30″, a weight of 6.75 pounds, an adjustable dual-spring flex-system, auto-locking buckles, extra-wide padded calf braces, and adjustable heel plates, shoes and legs straps. You don’t need any tools to adjust the height, and the stilts’ bases are made of non-marring high-grade material. The recommended user weight is 225 pounds. In general, buyers have a positive attitude towards the Gyp drywall stilts, and they praise their design and sturdiness. A user shares that it took him about 10 minutes to assemble these silver painter stilts and that he quickly got used to walking on them. Another happy customer mentions that these drywall painting stilts are sturdy, safe and perfect for anyone who wants to save some time or avoid using a ladder. A purchaser comments that he finished a kitchen remodeling faster than he expected, and his opinion as a contractor is that these stilts are the best professional drywall stilts available. However, some customers have complained that these drywall painter stilts are too heavy and that it’s difficult to adjust them properly. Some users also note that the calves’ straps tend to get loose over time and that it’s more difficult to walk on them than they expected. If you are searching for top-rated drywall stilts, you might want to consider these heavy-duty drywall stilts offered by Pentagon Tools. Users love the comfortable design and the color options, but some do note that they had problems with the bolts. These drywall painting stilts have a working height from 18″ –30″ inch, a dual spring design, adjustable heel plates, foot straps and padded leg bands, plus self-locking metal buckles and rubber soles. They are made of lightweight aluminum (recommended load capacity up to 228 lbs.) and thanks to the wingnut design you don’t need any tools to change the height. A happy buyer mentioned that it took her some time to get used to walking on these stilts, but they were very easy to assemble, and she felt safe and secure. The reviewer also states that they are perfect for a Halloween costume or for putting Christmas decorations. Another customer commented that she had no prior experience with drywall stilts, but she had no problems to walk on them and to adjust the height. She would recommend it to anyone looking for cheap drywall stilts. A happy user also states that the stilts are easy to maneuver and that it’s a pleasure to use them. However, some customers have complained that the straps tend to get loose while walking and that the stilts feel too unstable. Some also state that it’s too uncomfortable to wear these drywall stilts for several hours and that they started to fall apart only after a month. These red adjustable painter’s stilts offered by Yescom are easy-to-assemble, comfortable and reliable. Users love the sturdy construction, but some do note that they are expensive. These red drywall stilts are made of lightweight aluminum, and they have a size of 32.1 x 12.4 x 7.5 inches, a weight of 15.5 pounds, dual action springs, skid-resistant rubber soles, adjustable heel bracket, metal buckle straps and adjustable working height ( 24-inch to 40-inch). The recommended load capacity is 227 lbs and the wing bolt design guarantees that you’ll be able to adjust these stilts quickly and without tools. In general, users are extremely satisfied with the performance, design, and functionality of these red adjustable stilts for drywall taping and they don’t have any major complaints. A buyer shared that he had no problems to assemble the stilts and that they are sturdy enough to withstand his 220 lbs of weight. The reviewer also states that he would recommend these stilts to anyone who wants reliable, safe and reasonably priced drywall stilts. Another customer mentions that he has worked as a drywall finisher for 25 years and these are one of the best professional drywall stilts that he had ever used. The purchaser also says that it’s very easy to adjust the height and that it’s a piece of cake to walk on these stilts. A happy user also mentions that he has regularly been using these stilts and he still hasn’t had any accidents. However, one user complains that he had troubles figuring out how to adjust the height. 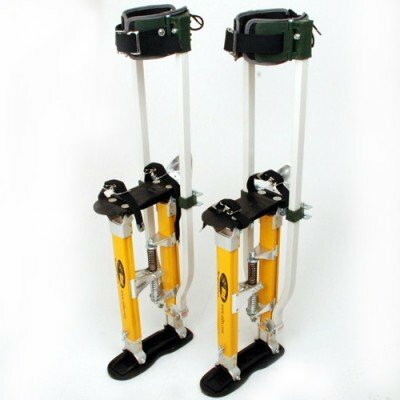 If you want high-quality, efficient and reliable stilts for painting or drywall taping, you might take a look at these dual support drywall stilts offered by SurPro. Users love the well-balanced design, but some do note that they are quite expensive. 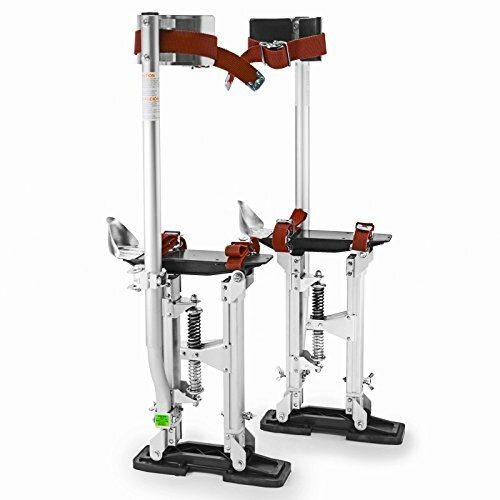 These adjustable drywall stilts are made of magnesium, and they have wrap-around leg straps, a wide foot plate with inner-looping straps, three-position heel bracket, an adjustable working height ( 24-inch to 40-inch) and a unique dual design featuring two side supports for better stability and balance. There is also a new interlock side pole bracket, so you don’t have to worry about falling. Overall, buyers have a very high opinion of the SurPro adjustable drywall stilts, and they praise their sturdiness and lightness. 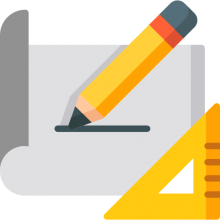 Moreover, users don’t have any complaints regarding their functionality and performance. A buyer mentions that he uses these stilts regularly and that he feels comfortable even after walking on them for a couple of hours. He would recommend them to anyone who is looking for the best drywall stilts available. Another reviewer comments that his daughter has had these performance stilts for a couple of months and there are no visible signs of damage or wearing. The customer also mentioned that he was very surprised by the sturdiness and durability of these adjustable stilts and that his daughter uses them daily for dancing, walking, and even for running with no issues. 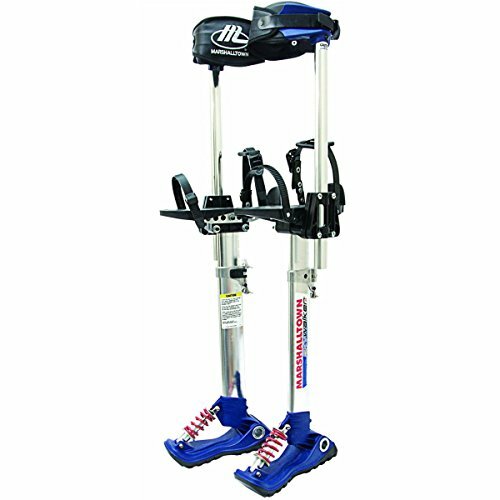 The Marshalltown Skywalker 2.1 drywall stilts are well-balanced, sturdy, comfortable and reliable. Users love high-quality construction, but some do note that they are heavier than they expected. 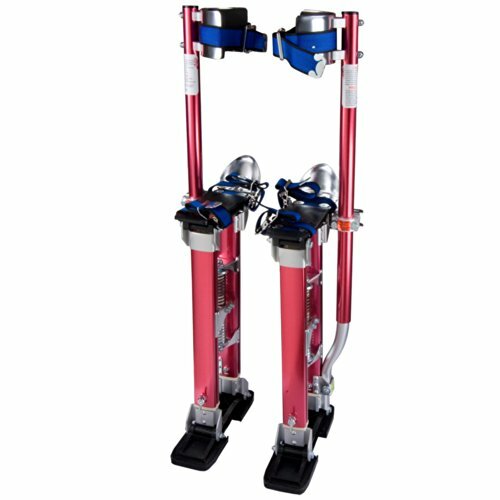 With a size of 12.8 x 11.3 x 24.5 inches, these stilts for drywall taping have an adjustable working height of 18-inch to 30-inch, a calf pad, a ratchet ankle adjustment, a locking toe strap, an aluminum reinforced footplate, a fully adjustable ankle spring and rubber soles for better traction. You can easily adjust the height with the flip and switch system, so this is an excellent choice for any professional drywall worker. In general, users have a mixed opinion regarding the Marshalltown adjustable drywall stilts. A buyer comments that he can wear these stilts for more than six hours and his legs wouldn’t get sore on the next day. The reviewer would recommend them for anyone that wants durable contractor stilts. Another user shares that the straps are comfortable, and they offer adequate support and padding, but he notes that the stilts are slippery. He warns that if you step on a little moisture, you can quickly lose your footing and fall. Another unhappy customer complains that the straps are made of cheap plastic, and they snap easily. Other users also have complained that they received a defective unit and that the footpad is plastic and it doesn’t offer enough traction. One of our early favorite drywall stilts is the GypTool Pro pair. Its manufactures advertise it as a great solution for doing drywall, wiring, painting and other tasks that require extended but maneuverable elevation. In addition, this pair of drywall stilts does not require any tools to adjust to increase its height, it's constructed from light-weight aluminum, and its working height is 18 inches to 30 inches with a 225-pound weight capacity. Indeed, the manufacturers have really focused on creating something that is especially lightweight- each stilt weighs 6.75 pounds, around 15 pounds put together. The designers have assembled non-rocking frames that utilize overlapping strut tubes with a dual-spring flex system for increased and enhanced mobility. One buyer that we spoke with said they took under 10 minutes to assemble. Another husband and wife purchased these stilts to do some ceiling renovations in their new home- they say it is a much more efficient way to do home rehabilitations, especially on ceilings and wall areas than clambering up and down a ladder that you need to move around the room constantly. As well, they told us that there is not a steep learning curve here- you'll pretty much figure out how to get these drywall stilts up and running right out of the box, but they do say you should wear some sturdy shoes and pants when you are operating the GypTool Pro. Another buyer told us that they actually use these for cosplay- apparently, the costume play they engage in requires stilt walking. Aluminum construction keeps the Pentagon Tools stilts pretty lightweight and the adjustable leg bands have padding for enhanced comfort as you work, with rubber soles to add some grip traction, preventing the possibility of slipping. One buyer we spoke to purchased them as part of a Halloween costume and say that they were easy to assemble, use and adjust, and in the off-season they use them to put up holiday Christmas lights around the exterior of their house. Another buyer told us that these are not exactly professional-quality drywall stilts, probably not the best option if you are doing home renovation 8 hours a day, but they are ideal for the DIY hobbyist who will use them less frequently. Yet another user said that in order to make things easier for yourself, you should be sitting on something higher than a chair when you put them on and prepare yourself to stand in them. Another option we examined was the Yescom aluminum stilts- they feature a 227 pound load capacity, dual action springs designed for enhanced flexibility, rubber soles to create skid resistance, and adjust from 24 to 40 inches for variable working heights. The manufacturers emphasize the design quality of these drywall stilts, saying that they really focused on creating a pair that would make leg movements feel as natural as possible, with enhanced control, stability and balance ensuring less fatigue throughout their use. Buyer feedback has been highly positive for these aluminum drywall stilts-with buyers saying that they are exceptionally simple to use and assemble. Indeed, one professional contractor that we spoke with told us that these are a pair of drywall stilts that he uses it every day on his different job sites. Other buyers purchased these to perform the occasional home repair task, whether that is adjusting a flush mounted ceiling fan or installing new fire and smoke alarms, finding them a useful tool to store away in the garage for when they need to access high ceiling areas in their home. The SurPro drywall stilts were another option that we took a look at- they adjust to between 24 and 40 inches and are constructed from magnesium. Magnesium construction actually makes them a little bit lighter than aluminum drywall stilts and the manufacturers say their wing bolt design has created additional versatility and flexibility, enabling you to adjust the drywall stilts without using any tools. One reviewer we spoke with says that they are sturdy and comfortable, providing great leg support. Many buyers purchased these for performance purposes-using them to perform on stage and entertainment venues. The last pair of drywall stilts that we examined was the Marshalltown Skywalker pair. Its manufacturers say that calf padding has been added to this model to enhance comfort, as well as a ratchet ankle adjustment with locking toe straps to ensure comfortable and tight fits. A flip and switch system has also been integrated to enable quick adjustment of the drywall stilts heights, with adjustable ankle springs to provide more natural walking motions as you perform your tasks. This particular pair of drywall stilts has received some mixed feedback- with several buyers saying that at 15 pounds they are heavier than they had expected. However, another reviewer who works as a professional drywall installation contractor said that these are pretty comfortable for extended use and that he hasn't experienced any leg or back soreness after using them for six hours a day. Indeed, another reviewer chimed in, telling us that they are indeed very comfortable to wear, but he did experience some dangerous slippery mess as he use them. He said that if you step on any drywall mud or moisture it's likely that you will lose your footing- he advised that the drywall stilts need rubber soles as opposed to the hard plastic bottoms that don't have any grip on them.